At Seal Methods Inc., our ability to create elastomer and plastic parts stretches beyond cutting of flat stock to extrusion and molding. We can perform injection or compression molding as well as extrusion of rubber, elastomer, and plastic parts used in an array of industries. 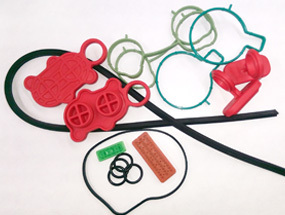 These additional capabilities widen the range of gaskets, seals, insulation, and other products that can be produced in-house and provide customers with a single source for all of their plastic or rubber component needs. Production is performed using computer controlled processes and in accordance with ISO/IATF 16949 registration to ensure all products are manufactured to customer specifications and the highest quality standards. Multiple components can be assembled, kitted, and packaged as required. This option can often provide significant labor and material handling savings to customers who order parts used in service kits or for a dedicated assembly. Additionally, our in-house quality team can provide industry standard peel adhesion and dimensional testing to ensure products comply with all customer specifications. Lead times are designed to work with customers’ schedules and expedited orders can be accommodated as needed. For additional information about our custom rubber molding capabilities, see the table below, or contact us directly. 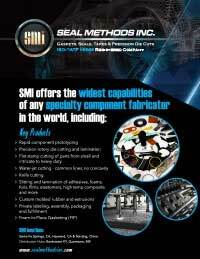 SMI is here to deliver the highest quality products. Connect with us today and let us demonstrate how we can fulfill your current needs and begin a long-term partnership.